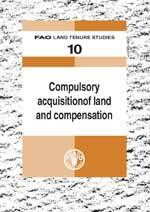 This guide on Compulsory Purchase and Compensation is written for people who work in land administration and all those with an interest in land, land tenure and their governance. Compulsory acquisition is the power of government to acquire private rights in land without the willing consent of its owner or occupant in order to benefit society. This power is often necessary for social and economic development and the protection of the natural environment. Compulsory acquisition requires finding the balance between the public need for land on the one hand, and the provision of land tenure security and the protection of private property rights on the other hand. Compulsory acquisition is inherently disruptive. Even when compensation is generous and procedures are generally fair and efficient, the displacement of people from established homes, businesses and communities will still entail significant human costs. Where the process is designed or implemented poorly, the economic, social and political costs may be enormous. Attention to the procedures of compulsory acquisition is critical if a government’s exercise of compulsory acquisition is to be efficient, fair and legitimate. This guide explains what compulsory acquisition and compensation are, and what constitutes good practice in this area. It examines the consequences of poor legislation, procedures and implementation in compulsory purchase and compensation and looks at how they can be improved in general, as well as in some specific areas in which compulsory purchase and compensation can be problematic. It draws out the lessons learned from the extensive experience and field programmes of FAO and the World Bank, and from parallel work in urban areas. The focus of the guide is broad, covering the widest range of possible situations. The guide is likely to be of most use in countries that are seeking to understand good practice in this area and to improve their own legislation, procedures and implementation in compulsory purchase and compensation in the interests of society as a whole.